You, as someone working in marketing, are helping to create, communicate, deliver, and exchange products and/or services that have a value for customers. But customers are brains… The processes that take place in their 3 pounds of cortical proteins and fats ultimately determine their purchasing behavior. Hence, this ‘short intro’ to the psychology behind CRO. First, an A/B test case. Which variant causes 12% more people to book a Van der Valk hotel room? Most people say they prefer the variation without the annoying popup, but the conversion rate is higher with the popup. How can a decrease in usability lead to more sales? System 1 is the oldest system (600 million years). It works on the basis of intuition, emotions, habits, prejudices and “heuristics”. It functions outside of consciousness, completely automatically and processes enormous amounts of information with seemingly little or no effort. All without the feeling of voluntary control. System 2 is a relatively new system (it became really apparent only 70 thousand years ago during ‘the cognitive revolution’). It is a conscious, rational, systematic and logical system. It uses scarce mental energy to control the impulses of System 1. 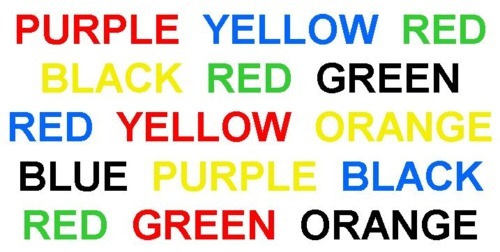 An easy way to experience both systems yourself is the Stroop Test. Read out loud the color of the words displayed below. You’ll probably find yourself (System 2) struggling to fight the automated (System 1) response, which is to read out the word instead of its color. Our System 2 has certain prominent characteristics. Since this is just an introduction, I’ll stick to three. First of all, it’s good to realize that our conscious System 2 is absent when we make most of our decisions (though we have the illusion that we are in control). An example: “I have two kids, one is a boy. What is the chance that the other is a boy too”? Most people answer 50%. But that’s not the logical answer. System 1 answered an easier, automated question (“What’s the general chance of having a boy or girl?”) and System 2 was absent. Our consciousness (System 2) is “post-decision rationalizing” all the time. If it was not involved (absent or depleted), it will make up “rational reasons” after the decision was made purely subconsciously. System 2 has a “very, very limited capacity”. For example, one group is asked to remember the number 39 and another group to remember 3,852,869. While remembering the numbers, they’re asked to choose a reward: chocolate cake or fruit salad. The “39” group chose chocolate cake only 41% of the time. Even though System 1 craves the cake, they have enough System 2 capacity left to control their impulses. In the other ‘3,852,869’ group, less System 2 capacity is left, and a staggering 61% opts for the chocolate cake. One of the results of our limited mental capacity is that our System 2 depletes during the day. We make more rationally controlled decisions in the morning, and more emotional ones at the end of the day. 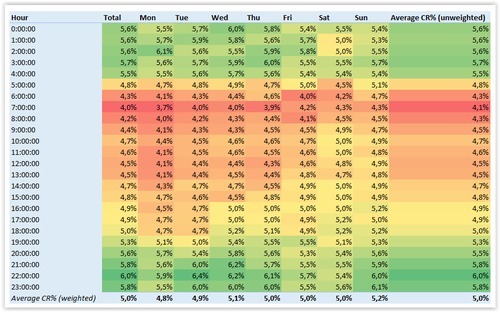 Therefore, it helps to plot your conversion rates based on the hours of the day and week. If you find a graph like the one below, you likely operate in a System 1-driven market (since lower impulse control leads to higher conversion rates). judging –almost always correctly– in a fraction of a second. Our automatic System 1 is therefore the true superhero in our brain. But one email is too short to explain anything more about the hundreds and hundreds of biases, emotions and heuristics it operates on. Please read my blog for some techniques. An example where System 1 totally determines the decision and System 2 should not get involved is this flash deal site. We deleted CTAs and made prices less apparent to keep System 2 asleep. Moreover, we made System 1 a bigger fan by adding large images and heart symbols. Yet sometimes it is totally the other way around. For example, when opening a savings account. We need System 2 to take and stay in control in this case, since System 1 would love to spend the money on more instantly rewarding things (like one of those flash deals). In the example below, we took away the (distracting and depleting) navigation. Most importantly, we put the full focus on only one of the interest rates (preventing System 2 from doing the depleting calculation). Now think back to the Van der Valk hotel case. Although our System 2 dislikes the energy-costing popup, our System 1 experiences something different. It sees a first click, and automatically draws the conclusion that you like this site better than others (that you did not click). It will remain consistent with opinion, and is thus more likely to book a room after the user-unfriendly popup. So, psychology teaches us that consumer behavior and user experience are extremely complex (fortunately). At the core, there are 2 systems that determine behavior and experiences. You can use this knowledge about psychology to make true sense of your CRO efforts, and make them more effective. Try to map which system is in control on each page of your site and in each visitor segment by re-analyzing your data and test results. For System 2, focus on one thing. Offer post-decision alibis, make it effortless. For System 1, start learning more about the hundreds and hundreds of persuasive biases and heuristics to make the most emotionally delightful experience possible. For more from Bart, check out Online Dialogue and Wheel of Persuasion.